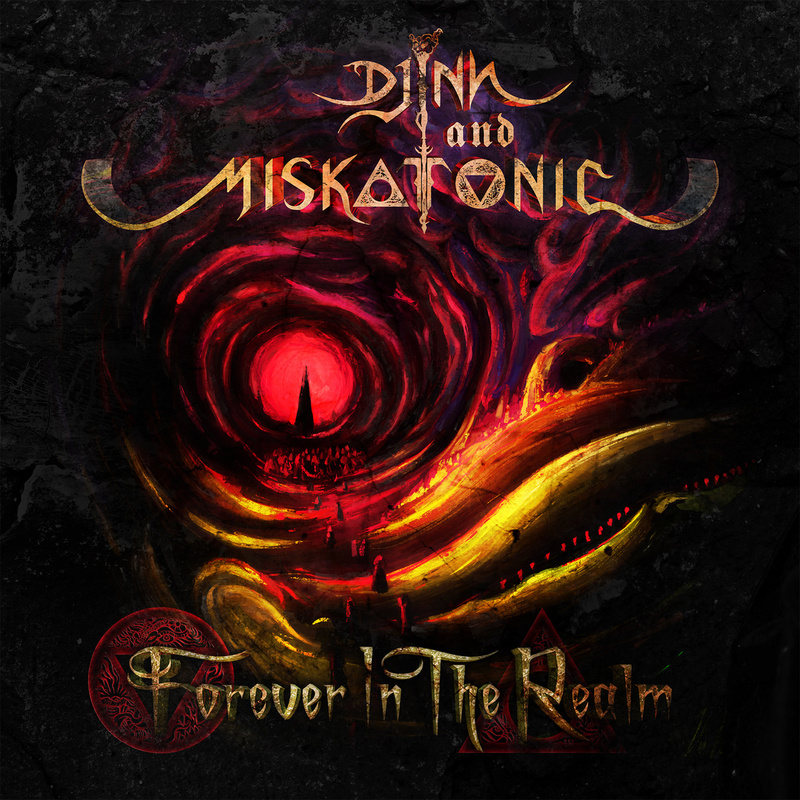 Achintya Venkatesh reviews the new album released by Djinn & Miskatonic titled Forever in the Realm, released via Transcending Obscurity India. Doom metal is a style that is still relatively foreign in the embryonic metal ‘scene’ and its enthusiasts in the subcontinent, and the past few years have seen the rise of a few bands playing around with the genre, which has at the very least brought to fore the existence and awareness of this slower side of extreme metal. This has always been overshadowed by the more dominant, velocity-fuelled side of things regardless of geographic location. Doom metal has trodden a variety of paths since its inception during the zenith of Black Sabbath and the then incipient Pentagram and similar bands, and has thereon gone onto spawn forth a variety of stylistic derivatives. While not all of these are congruent with the proto-type of the genre, perhaps the most obvious commonality all these aural offspring have is their lumbering pace and crushing minimalism. If Bevar Sea presented the more jammy, convivial side of Bangalore’s nascent doom/stoner movement (if one could call it that), and Dying Embrace the monstrous local overlords of the death/doom mould, then Djinn and Miskatonic present a more reticent, sedated and punctilious position that is more thematically focused and staid. The band name’s etymology is an open exaltation to their thematic inspirations, ranging from classic horror to weird fiction, à la H.P Lovecraft. The name is a play on the gin and tonic cocktail – djinn being the Qur’anic equivalent of genies and Miskatonic being a fictional university, featured in a series of stories in the Lovecraftian mythos. ‘Forever in the Realm’, the band’s debut album after being active for around two years as a live band, merges a variety of these styles into its creative mould – primarily traditional doom in the vein of Trouble and Saint Vitus with very healthy doses of more jammy, stoner influences – think Electric Wizard and Sleep, and even hints of death/doom and sludge metal. The introduction of a guitarist in the band in turn omitted the more drone-driven, spacey quality that the band previously exhibited, and this is certainly evident in the album. ‘7 Year Witch’ is the tone setter of this record and opens with a direfully commanding spoken word about the depravity that is witchcraft, and soon descends into an infectious riff that is rather standard by doom norms but enjoyable nevertheless. The vocal approach is something one immediately takes note of, and showcases a wide range of styles that cover everything from impassioned warbles to harsher growls. The leads are laden with striving lead work that is reminiscent of Dave Chandler or even Tony Iommi. The band drops a bombshell with a bombastic, groove-laden, thrashing segment that I’ve often observed is an additive to the dynamics of the band’s sound in a live setting, and it is no different on record. ‘Book of the Fallen’ brings to fore a more robust facet of the band – the pace is almost marching in a sense and the entire mode of action is far more menacing than foreboding. It certainly isn’t devoid of coercive doom segments, which have some excellent melodies that are complimented by befittingly clean vocals working in congruence with the aforementioned leads. The track that follows, ‘Vulcan’s Force’ enters the realm of dark humour and surrounds alcoholic excesses and consequential contemplation on the futility of existence. The guitars take a step back and make way for more fuzz-driven, baritonal bass work. The ritualistic electronic/ambient track ‘Voice from the Tomb’ serves as an interlude of sorts that features undecipherable waves of spoken word from the deepest crypts. ‘Weird Tales’ is the goliathan track of the album and is in a sense a summation of the various elements that forms the Djinn and Miskatonic creative canvas, channeling the bizarre, abstruse and esoteric. Dismal, cheerless and creeping bass-lines bleed into guitar riff-led dawdling, with tempo changes and vocal modulation aplenty. The charm of this release essentially lies in its sensibly primal minimalism. Axe-man Sriram K.R’s presence in the band has turned its sound into something less befogged and more monolithic, while Jayaprakash Satyamurthy’s bass work is likely to seem drowned out to the casual listener courtesy of the dominating guitars. However, a seasoned listener of the heavier side of music will quite easily be able to construe the bass-lines, which serve to illuminate and accentuate the riff in focus. A casual enthusiast need not fret apropos this nebulosity; as fuzzed out, solo bass guitar segments are ample which successfully throw light on this highly imperative instrumental facet of these droning-doomoid rockers. The bass work could perhaps be compared to the likes of Tim Bagshaw, who is known to alternate between bone-crushing dirges and spaced out, yet jammy elegies. The guitar tone is satisfactory, and is sufficient to please the seasoned doomster, while not scaring away the casual listener either. Siddharth Manoharan’s percussive dexterity is solid and handles tempo changes with ease, and certainly brings in some enjoyable grooves and fills into the compositions. Gautham Khandige’s vocal style is rather unique, at least going by the little knowledge I possess of the genre, and invokes sonorous theatrics, aural timidity and harshness at desirable and appropriately opportune times. If a comparison is a must, I would liken his vocal approach to the likes of, say, Scott Reagers, who had excellent operatic/clean vocal abilities and yet had an enjoyable dissonance to his voice that made Saint Vitus all the more unusual and noteworthy. Yet at times, the more harsh vocals are eerily similar to Lee Dorrian of Cathedral (circa Forest of Equilibrium era). The cover artwork, conceptualized and furnished by Nicolas Huck is impressive, and envisages a sense of otherworldly allure and fantasy. In summation, ‘Forever in the Realm’ is an effort that certainly impressions upon one, and is unique in a variety of ways, although it doesn’t impart anything very groundbreaking stylistically sans the welding of the various sub-genres of the greater doom sphere. But it would be unfair to view it purely from a genre-specific angle, and one should take into account the demographics of the band’s local scene, and in that light the band is certainly a unique force, and is hopefully one of many such releases from the area.